After reading a bunch of these when I was younger and always wanting to make a dynasty, myself, I decided to finally pull the trigger and start one of these stories, even though they aren't as popular as they once were. Hopefully I have fun with this as much as I am having fun playing the game and the save. Had to go with the Pelicans seeing how dominant AD and Boogie are and knowing how good they are in the game. They're a couple pieces away from being contenders, IMO, and hopefully the Warriors start declining soon and I can get the Pelicans to be top dogs in the West. In a bizarre turn of events, the New Orleans Pelicans have decided to make changes to their front office, by bringing in a new General Manager in Loupeitak. Just about a year after Dell Demps orchestrated a move that shook the NBA by acquiring Demarcus Cousins from the Sacramento Kings, the Pelicans have decided to part ways with Dell, and signed a complete unknown, all while the team is battling for a playoff spot in the very competitive Western Conference. We will have to see what the new GM is capable of with the Trade Deadline approaching. 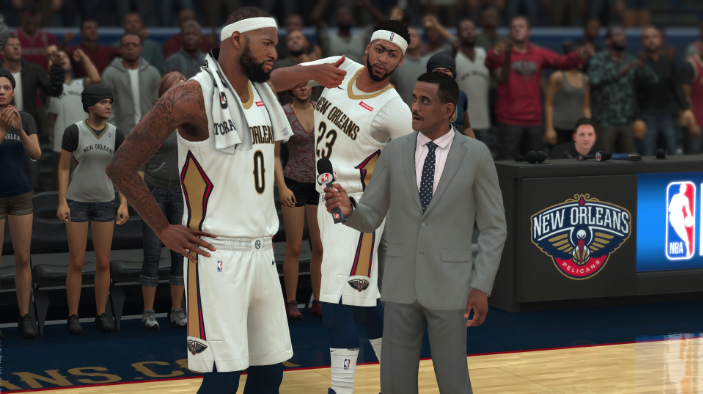 Will the Pelicans manage to find key pieces they are missing? Last edited by Loupeitak on Wed Jan 24, 2018 8:11 pm, edited 1 time in total. After only a couple of days in the office, new Pelicans GM, Loupeitak, orchestrated one of the biggest blockbuster deals of this season. After a huge acquisition last year with Demarcus Cousins, and looking for pieces to complement their core of Davis, Cousins and Holiday, New Orleans have submitted a massive trade involving 3 other teams, among them the Charlotte Hornets, the Memphis Grizzlies and the Houston Rockets. With this trade, the Pelicans once again win the sweepstakes for an all-star player on the trade block and manage to put a player like Kemba Walker running the show with the twin towers of New Orleans. In the trade they have also received Nicolas Batum, Jamychal Green and Nene, good 3 and D players and a solid backup Center that should help patch up the team's weaknesses. However, bringing in so many new players, while losing some rotation players will definitely affect chemistry and we're going to have to see if the Pelicans can still keep it together to continue competing for a Western Conference Playoff seed. The Charlotte Hornets, on the other hand, go back into rebuild mode and manage to shed some contracts in Batum and Michael Kidd-Gilchrist, while taking on Asik, who only has $3M guaranteed in the 2019-20 season and is expected to be waived, E'Twaun Moore, who has proved to be a valuable role player and can be leveraged to another team, and a plethora of draft picks from the Pelicans. To help out with contracts, the Grizzlies took on Michael Kidd-Gilchrist, who should help them even more on defense, and the Rockets manage to get a second point guard in Rajon Rondo. On another note, the Pelicans have taken a gamble to bring back Monta Ellis to the NBA, looking for a player that could play both guard positions as a spark from the bench, signing for the Veteran Minimum for 1 year. Monta Ellis wasn't known for his efficiency or defense, but hopefully he can help the Pelicans 2nd unit, and being paired with Tony Allen should help mitigate some of his weaknesses on defense. Chris Bosh is also back to the NBA, having finally been cleared to play, signing with the Minnesota Timberwolves for the full Mid-Level Exception. His minutes are expected to be very incremental as his health is monitored closely by the Wolves medical team. We wish Bosh the best and hopefully we get to see the All-Star and NBA Champion back on the court. A couple of days after Demarcus Cousins' historic night agains the Bulls, Pelicans shook up their roster in hopes of solidifying their playoff run, bringing in All-Star Kemba Walker. Ironically, the Pelicans faced the Hornets in Charlotte right after the trade. Kemba Walker started off slow, clearly still uncomfortable in his new team, playing in front of his old crowd, getting blocked by Dwight in his first two possessions, going scoreless in the first quarter and only contributing with 3 assists. The Pelicans as a whole looked uncomfortable, dealing with some clear chemistry issues with their new lineup of Walker, Holiday, Batum, Davis and Cousins. Marvin Williams, however, was on absolute fire, going 5-5 from 3 and putting up 19 points for the Hornets in the first quarter alone. It didn't matter if he was well guarded, or by how many players, his shot couldn't be stopped. The 2nd units came in late in the quarter, and nothing changed much, with Monta Ellis coming back to the NBA starting off 0-5. After one, the Hornets led by 14. In the second quarter, the game started pretty much the same, with the Hornets being much more dominant. Frank Kaminsky looked very solid, getting a couple of huge blocks and altering many layup attemps by the Pelicans. 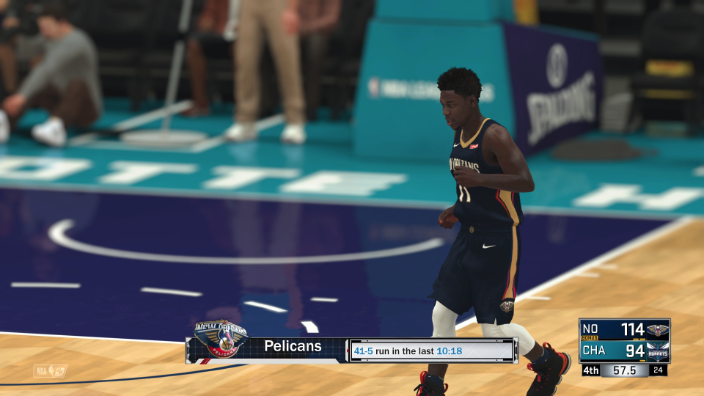 However, before Alvin Gentry put his starters back in, Darius Miller and Jamychal Green sparked a nice 12-0 run with a couple triples to keep the Pelicans in the game. Kemba Walker shook off his nerves and showed the Charlotte crowd what they would be missing, starting to get solid drives and layups in the pick-and-roll with his two giants, and getting a bunch of fouls racked up on the Hornets team, including 4 fouls on new Hornet E'Twaun Moore. Going into the half, the Pelicans, who were down as much as 19, managed to get the deficit down to 2. In the third, nothing notable happened with much of the 1st quarter repeated, the Pelicans not being able to hit any shots, even when wide open, and conceding many turnovers. The Hornets kept playing consistently and racked up the lead to 14 again heading into the 4th quarter. However the last quarter of the game was a completely different game. 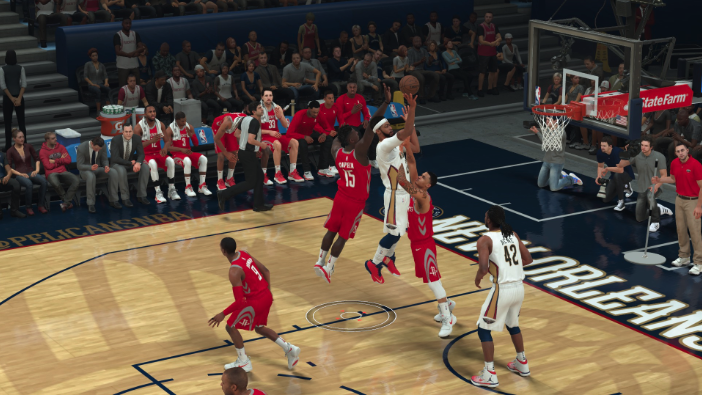 It seemed all of a sudden the Pelicans learned how to play with each other and managed to find their shots. They started out the quarter with a 15-5 run, mostly fueled by Monta Ellis, who was starting to get back into rhythm. The Hornets got very careless with the ball, conceding a bunch of turnovers and taking bad shots that were swatted away by the duo of Davis and Cousins. It was a completely different ball game defensively for the Pelicans as the Hornets scored their last bucket of the game with 8:55 left from a shot by Marvin Williams. They wouldn't get any single point from there on out, with the Pelicans going on an insane run. At 4:57, Kemba Walker got the first lead of the game for the Pelicans on a freethrow and they never looked back. Walker would end the game with a game high 23 points and 11 assists on 6/10 FG, showing how many fouls he was managing to draw. After his historic night, Cousins posted up a very respectable 21 points, 19 rebounds and 3 blocks, while Davis also put up a big 21 point, 18 rebound and 3 block performance. Holiday added 16, while Monta Ellis led the bench with 12 points, 3 rebounds, 3 assists and 1 block of his own. Very decent return to the NBA for Ellis. On the other side, after getting 19 in one quarter, Marvin Williams ended with 23 points and 6 rebounds, while also getting 5 steals. Jeremy Lamb put up 18 points and E'Twaun Moore 14. Moving forward, the Pelicans definitely need to find the consistency they found in the 4th quarter as they shouldn't be losing to Charlotter after fleecing them in the Kemba Walker trade. A few practice days after their tough win over the Charlotte Hornets, the New Orleans Pelicans hosted a game versus one of the Western Conference top dogs in the Houston Rockets. Rajon Rondo greeted his old teammates during warm up, and joked around with Demarcus Cousins, a player who was high on Rondo when he was still a Pelican. 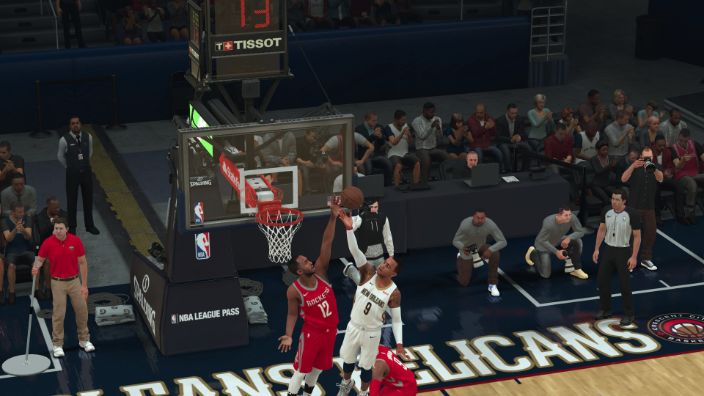 Right after tip-off, Anthony Davis quickly asserted his dominance over his weaker defender in Ryan Anderson, promptly abusing him down low with a myriad of post moves, offensive rebounds and dunks. His strong start got the home crowd roaring as soon as Cousins got a block on one end and pushed the break himself, throwing a lob to Davis who dunked it hard over Ryan Anderson. Seeing Davis on a roll quick, the Rockets quickly made adjustments putting Capela on Davis instead, but the damage was done as he wasn't much of a match either and got pulled early in the quarter with 2 fouls. 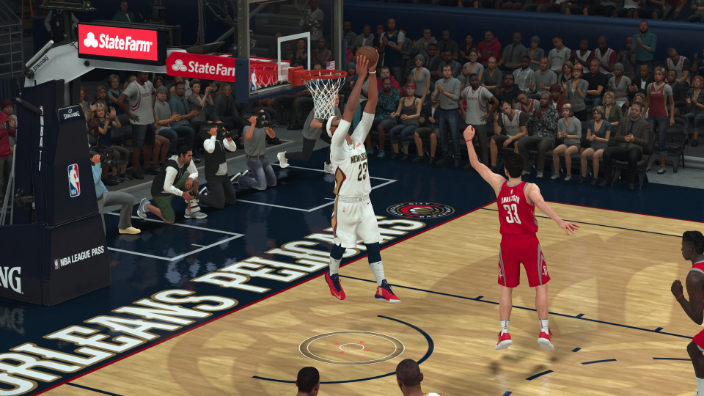 On the other end, however, the Pelicans struggled with the duo of Chris Paul and James Harden's 3 point shooting. 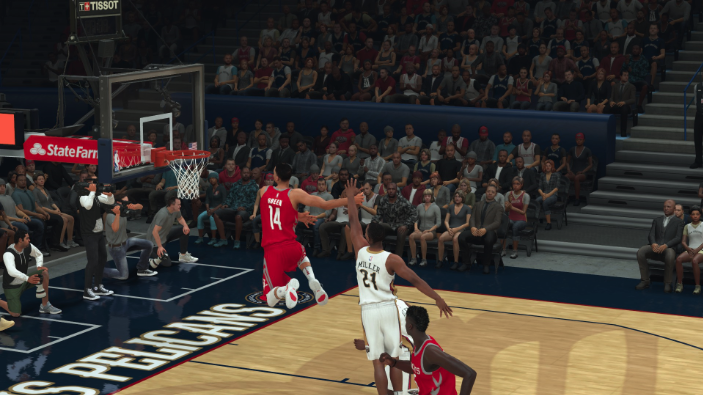 When they did manage to contain the two star players, Trevor Ariza showed he could also hit shots, and even with Davis putting up 17 in the quarter, the score was close at 26-31 for the home team. In the second quarter, Mike D'Antoni decided to play Capela with the second unit, and the Pelicans bench had no answer for him and Eric Gordon. Either they managed to defend Gordon on the perimeter, but Capela would snag the offensive boards and get easy dunks, or Gordon would be raining down 3 pointers. This would result in the Rockets starting the quarter with a 15-4 run, and by the time the Pelicans put some of their starters back in, the home team was down by 8. Still expecting Davis to be on fire, the Rockets kept pressuring him everytime he got the ball, with Capela doing an excellent job defending him, along with double teams and perfectly played passing lane interceptions to Cousins, forcing turnovers and easy layups on the other end, something the Rockets do so well. Adjusting to this, the Pelicans sent out Kemba Walker, who again started the game slow, but with all the pressure on the frontcourt, found his rhythm, putting up a quick 9 points, along with some excellent assists to open 3s by Holiday and Batum. By the end of the first half, the game was tied at 58. The second half started much as the first one did, this time with a different protagonist in Demarcus Cousins. Capela continued defending Davis, so it was Cousins' turn to abuse both Ryan Anderson and Luc Mbah a Moute. On the other end, the Pelicans still had no answer for Harden and Eric Gordon, who kept popping 3 after 3 and layup after layup. Staggering their tower's minutes, the Pelicans played Davis without Cousins pressuring the other big. However, Anthony Davis showed everyone why he's one of the best in the league, stepping up and getting a bunch of 3 point plays on Capela, putting him back in foul trouble. With no other big man on the roster capable of even containing Davis, the Rockets risked it, but got punished when Capela picked up his 5th foul with 2:59 left in the 3rd quarter. As Cousins came back in, and Davis got some rest, he also got himself in foul trouble, being no match for Eric Gordon, picking up 4 fouls as well. With the two team's Centers in foul trouble, and the other star players looking unstoppable, we were in for a hell of a 4th quarter as the two teams finished the 3rd tied 95-95. In classic Rockets fashion, a couple of threes by Ariza and Harden put the Rockets up by 7 to start the 4th. With Capela still out, however, Kemba Walker and Cousins continued abusing Ryan Anderson on the defensive end with some easy pick n rolls, leading to easy layups and free throws. 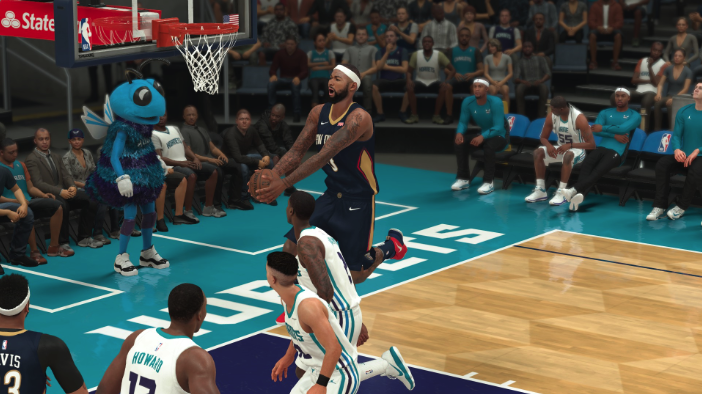 And as soon as Anthony Davis came back in, the Pelicans got the crowd ramped up when Cousins blocked a shot, passed it out to Walker by the halfway line, who immediately threw a perfect lob to an Anthony Davis reverse alley-oop dunk, giving the Pelicans a 3 point lead. As the Rockets hustled to keep the Pelican's 3 all-stars in check, Nicolas Batum found himself a bunch of open space and easy layups, definitely a big contributor as the Pelicans expected when they got him in the Walker trade. Down by 7 with 2:10 left, James Harden stepped up, making some big shots for a final push. Chris Paul helped the cause, getting a steal and layup to cut the Pelicans lead to 3, but Kemba Walker would have nothing of it, euro-stepping his way to the basket to get the lead back to 5 with 1:10 remaining. Chris Paul went back the other way, pulling a move on Walker and getting a very difficult floater over the outstretched arms of Anthony Davis, making the game a one-possession game again. With Walker missing on the other end, the Rockets found themselves with the ball, down by 3, with 30 seconds remaining, and called their last timeout of the game. With an excellent designed play, the Rockets got the inbound pass to an open Chris Paul at the top of the key. His shot would bounce in and back out again, and the Pelicans would grab the rebound with 3 seconds between the shot clock and the game clock. Using up all the time they could, Kemba Walker would miss another shot, giving the Rockets a chance to push for a game tying 3 pointer with 4 seconds left. However excellent full court pressure stalled the Rockets long enough and Harden was forced to pull up from 35 feet, missing, and sealing the Pelicans victory 127-130. 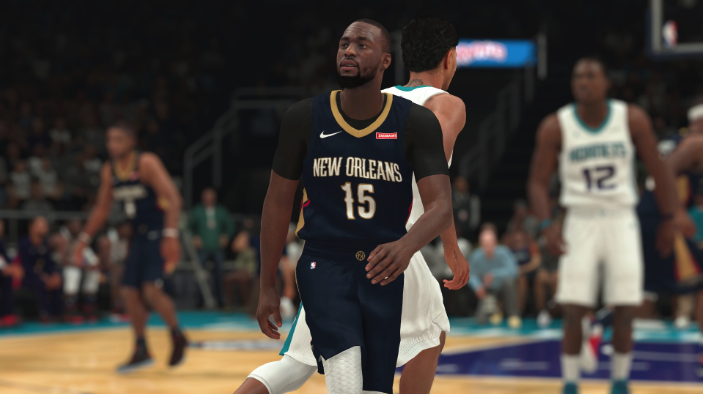 Anthony Davis led the Pelicans with a massive 39 points, 11 rebounds, while Kemba Walker continued his excellent performance with his new team, putting up 27 and 10 assists. Cousins added a very good all-around game with 16 points, 8 rebounds, 4 assists and 4 blocks, while Batum, Holiday and Monta Ellis all finished in double digits as well. On the Rockets, Harden had 34 points, while a foul ridden Capela still put up 22 points and 15 rebounds. Paul and Gordon chipped in with 19 and 17 respectively, with Paul also putting up 11 assists. After some turmoil in the Los Angeles Clippers' locker room, DeAndre Jordan looked to be on his way out of the team. While many predicted DeAndre to land in the Cavaliers, who are looking to add size, it was the Kings that pulled the trigger for the athletic big man, sending out Zach Randolph and Garrett Temple. Not sure what this means for the Kings, who are last in the Western Conference, or the Clippers as they didn't get any younger pieces. 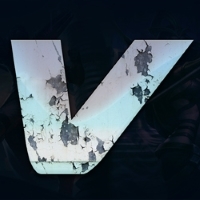 We'll have to see how the two teams do moving forward. In other news, Bulls have acquired J.J. Barea and Dorian Finnley-Smith from the Mavericks for Robin Lopez and their 2021 2nd round pick, while the Grizzlies have traded Ben McLemore and Kobi Simmons to the Timberwolves for Cole Aldrich and Anthony Brown. Sixth-man candidate Lou Williams got a hefty extension with the Clippers, reportedly worth $38.81M over 3 years, while the Suns used up their plentiful cap space to re-sign Alex Len to $48.82M over 3 years. With just 2 games left in the month, the New Orleans Pelicans would end January 1-1, losing to the Los Angeles Clippers at home, where Cousins played a mere 18 minutes before fouling out against a team without DeAndre Jordan, and proceded to take a close nail biter 115-117 vs the Kings, who got the aforementioned Center. 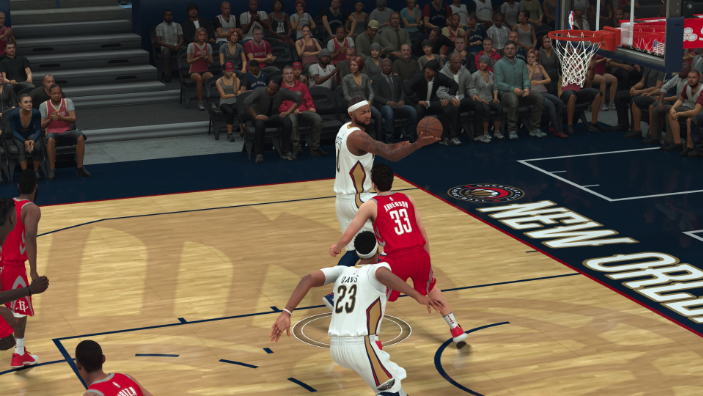 This put the Pelicans at a record of 28-22, good for 6th in the Western Conference. February looks to be a decent challenge for the Pelicans, as they have to face the Thunder, the Wolves, the 76ers, the Bucks and the Spurs, along with, most likely, not getting much rest on their star players as the All-Star Weekend is approaching. We'll have to see how the team continues to mesh and improve, as they try to solidify their playoff seed contention.